Thanks to a fully funded grant scholarship from Web of Life Field (WOLF) School through the NOAA B-WET program, 40 6th grade students from Manzanita Charter Middle School in Richmond, CA were able to participate in a 4-day residential outdoor science camp with WOLF School at Little Basin Cabins and Campgrounds, a family and group camp of Big Basin Redwoods State Park. 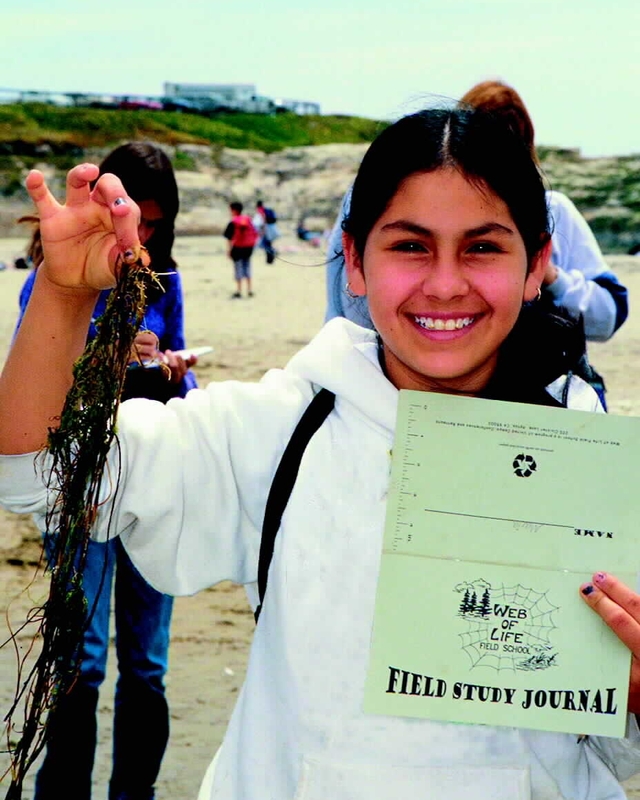 The NOAA Bay Watershed Education and Training (B‐WET) Program is an environmental education program that promotes locally relevant, authentic experiential learning focused on K–12. NOAA awarded WOLF School a B-WET grant for their efforts in outdoor science education and with it, WOLF created the Redwood Trees to Coastal Seas program—a pilot program providing watershed education to students that has achieved remarkable success—and offered a scholarship to students. The Manzanita Charter Middle School students and 10 adult chaperones began their watershed experience with a pre-trip presentation from WOLF School, in which they were asked the question, “What is a watershed?” As students shared their responses, “A place where water is stored. A place for water to go. Something holding water!” excitement built and the intent of the program became clear: they were going to spend 4 days and 3 nights in the redwood forest at WOLF School Little Basin, learning the importance of watersheds and how to better care for them in the future. “Why are we cleaning up this beach? It’s already clean. We should be cleaning up the beach in Richmond!” said an engaged student on the sands of Waddell Beach, located north of Santa Cruz and part of the Big Basin Redwoods-Rancho Del Oso State Park. The beach clean-up was held in partnership with the Monterey Bay National Marine Sanctuary and Save Our Shores, and was an integral part to the student’s watershed educational experience, both at WOLF and once back home. Students were able to investigate water samples from Blooms Creek at Little Basin and compare them to the water at the base of the Waddell Creek Watershed. They noticed that there was a difference and explored what factors might have influenced the water along its path from forest to beach, putting WOLF School’s Redwood Trees to Coastal Seas program to action. Conclusions were drawn based off of specific-point and non-point pollution, and questions were asked about the quality of their water at home. As a connection to the Redwood Forest, students also measured the height, diameter, water needs, and soil components of various Coastal Redwood Trees around Little Basin. All of this data was recorded in student journals and referenced throughout the program. As a culminating part of their experience, students were asked to develop an Eco-Action Stewardship Plan that they could implement once they returned to school. Focusing on different ideas of change within their community, groups discussed changing school lunches, limiting water usage at school, doing a cleanup in their local area, and starting an edible school garden. The goal of empowering these students to create local change was achieved, as discussions continued on throughout the duration of the program and once back in their Richmond classroom.